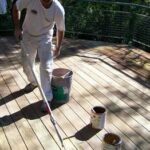 Expert tips on planning a new wood deck, including how to buy the best deck materials, how to plan deck construction, and choosing deck materials. Low-level deck expands this home’s living spaces out into the yard. 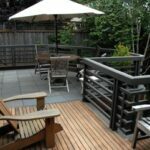 A beautiful, versatile wood deck can add pleasure to daily living. Wood’s warm color and soft texture bring something of the forest into your landscape, and if stained it can hold its own in even the most formal company. Equally as important, a deck is a long-term investment because it increases the resale value of your home. A deck provides a durable surface requiring little or no grading and a minimum of maintenance. Because decking is raised above the ground and can dry quickly, it’s a natural wherever drainage is a problem. Survey the yard and decide which problems the deck should solve. Decks can be built over steeply sloping ground, along a side yard, or even in front of a house as an entry. Consider wind direction, the amount of sun or shade desired, the availability of water and electrical outlets, and other fixed conditions. Generally, the southwest and southeast corners of a house offer the best combination of sun and shade. Be sure to check local building codes and regulations to determine what guidelines and restrictions you must follow. Consult a building professional if the deck is to be extensive or the construction difficult. If you decide to do it yourself, you may want to divide a large deck project into smaller, more manageable projects. Softwoods like redwood and cedar are traditional, but hardwood imports offer new options. For even less maintenance and a lower environmental impact, consider so-called composite decking, which is made from recycled materials. Note, however, that you’ll still need wood or another material for structural members–composites aren’t rated for strength. The rugged, knot-textured garden grades, which are more economical than architectural grades, are ideal for outdoor structures. Choose an all-heartwood grade such as Construction Heart or Deck Heart for applications on or near the ground. The sapwood-streaked grades, Construction Common and Deck Common, for example, are good choices for above-ground applications such as the deck boards themselves. A variety of joist hangers, patented connectors, and deck fasteners are available to help the do-it-yourselfer. Always use top-quality, hot dipped galvanized, stainless-steel, or aluminum hardware. To avoid splitting, pre-drill holes for nails or screws at the ends of the decking boards. 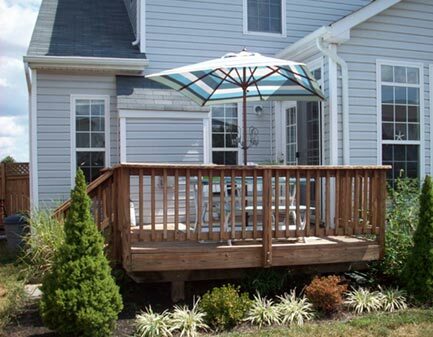 Typically, any deck more than 30 inches above ground requires a railing or similar barrier. Beyond safety, railings contribute an important design element, too. What’s the view? Use railings to frame it or block it. Fill gaps with vertical slats, acrylic, or grillwork. For long-lasting good looks and performance, a quality water-repellent finish containing a mildewcide and an ultraviolet inhibitor is recommended For best results, the finish should be applied directly to the lumber before construction and cover all sides, edges, and ends. 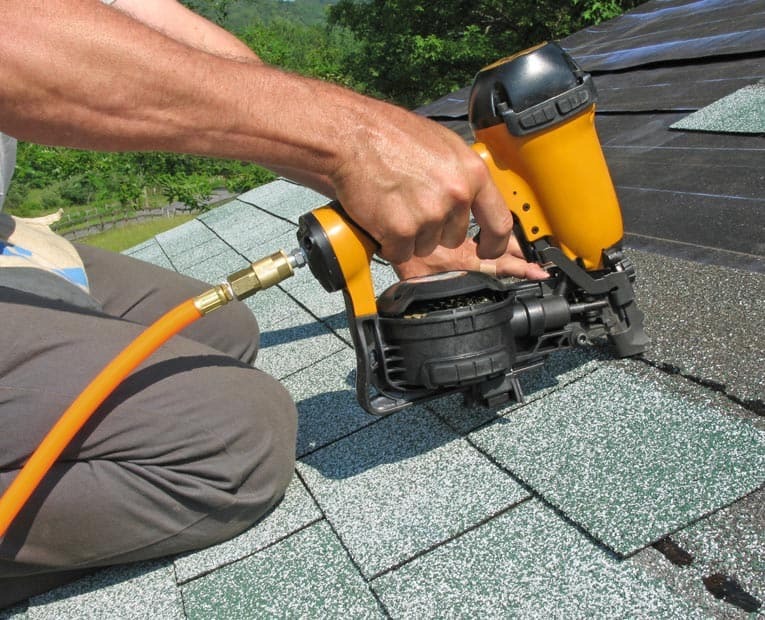 A second application is recommended when the deck is completed. After the deck is finished, adding amenities completes the job of individualizing your project and making it a true outdoor living center. Popular add-ons include spas, shade shelters, privacy screens, built-in benches, and planters.